A new day, a new legal development in the complicated tale of Gov. David Paterson and his alleged communications with a woman who accused his aide of domestic violence. Wells is a partner at Paul Weiss and widely considered to be one of the top white-collar criminal defence lawyers in America. When we named the country’s top litigators, Wells was frequently mentioned by his peers as a name that must appear on the list. We’ve reached out to Wells to see if he has been officially retained by Paterson, or if it was just a consultation. This news comes the same week that Paterson aide Marissa Shorenstein disclosed that she is represented by another big-time defence attorney, K&L Gates partner Laura Brevetti. 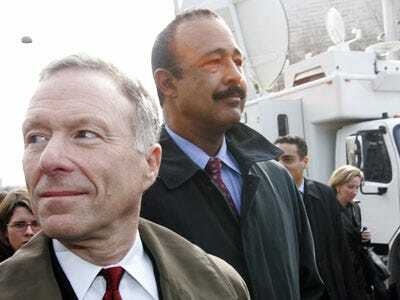 Wells is pictured above with Lewis “Scooter” Libby; Wells lead Libby’s unsuccessful defence against perjury charges. Then-President George W. Bush commuted Libby’s sentence, though Bush did not grant a full pardon.